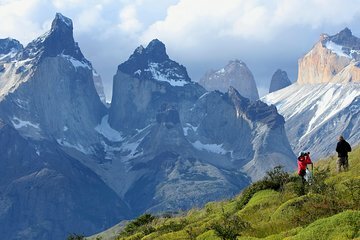 The Torres del Paine National Park is a UNESCO Biosphere Reserve and home to some of Patagonia’s most spectacular landscapes. Admire the snow-capped mountains, glacial lakes, and cascading waterfalls on this private full-day tour from Puerto Natales, including a visit to the Milodon Cave. Tour includes hotel pickup, lunch, and round-trip transport. Your tour begins with pickup from your central Puerto Natales hotel by your private guide. Traveling by private vehicle, admire the rugged Andean scenery on the around 3-hour drive north to the Torres del Paine National Park. Spend the day exploring the magnificent landscapes; marveling at lakes, glaciers, and waterfalls; and enjoying views of the dramatic Horns of Paine mountain range. Along the way, visit the ancient Miloden Cave, enjoy a delicious lunch (included), and spot wildlife such as guanaco, Andean deer, and rheas. On return to Puerto Natales, your tour ends with drop-off at your hotel around 5.30pm.